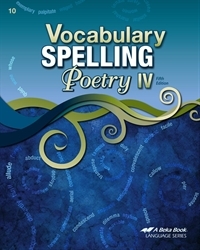 Stimulate your child’s analytical and memorization skills with Vocabulary, Spelling, Poetry IV. This text puts an emphasis on the origin of vocabulary words; word analysis through the study of prefixes, roots, and suffixes; word analogies; synonyms and antonyms; and classic poetry. 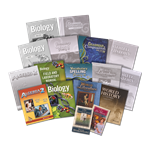 This text is broken down into 12 units; each unit includes 12 vocabulary words, 2 sets of 20 spelling words, a list of prefixes, roots, and suffixes; and 5 word exercises to help implement new concepts. Ten well-known poems are also included for recitation and memorization to enhance the appreciation of poetry.